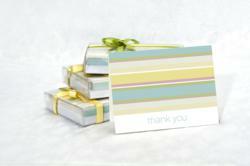 CardsDirect.com donates thank you cards to OprationShower.org to help provide baby showers for military moms-to-be. A baby shower is a special event and we hope we can make some positive difference by helping provide a baby shower for these expectant Moms whose husbands are deployed. CardsDirect LLC (http://www.cardsdirect.com), a leader since 1998 in the category of corporate and personalized stationery, is proud to announce its partnership with Operation Shower (http://www.OperationShower.org), a non-profit organization whose mission is to provide joyful baby showers for military families to ease the burden of deployment. Operation Shower sends a “shower in a box” to military families who are expecting babies while their husbands are deployed. Through generous donations and a team of tireless volunteers, moms are showered with attention and parties on and off military bases throughout the U.S. Believing that every new baby deserves a special welcome, even if dad is away from home, Operation Shower is pleased to be able to provide this service. In partnership, CardsDirect custom designed a special thank you card, perfect for these military moms to use any way they wish. The cards were packaged and shipped to Operation Shower where they were included in the shower gift boxes the military moms will receive. CardsDirect actively supports charitable organizations throughout the year and features custom imprinted and personalized cards in every category from birth announcements, photo cards, holiday cards and invitations to birthday cards for business and personal use. For an easy ordering process, quality you can trust, the ultimate in design selection and outstanding customer service, CardsDirect has consistently provided the very best in personalized greeting cards for over 10 years and is happy to partner with Operation Shower in this worthy cause. Operation Shower began in March 2007, when LeAnn Morrissey, looking for a way to give back to her uncle who was deployed overseas, was asked to send a card to 4 women who were expecting babies while their spouses were deployed. LeAnn decided to try to do much more for these families. She set out with family and friends to send a “shower in a box”. The overwhelming support she received putting these boxes together and the messages of thanks from these moms left her with little doubt that this was something worth doing — over and over again! She joined with Kris Jackson to hold the first unit-wide shower at Ft. Bragg, NC in June 2007. From that point forward, they made it official and Operation Shower was born! Learn more about Operation Shower and ways you can help by visiting their website at http://www.OperationShower.org.